"Harry Eng, bartender and friend to many, worked here for nearly 50 years and in 2006 and retired from The Moon Temple at the age of 72. Harry, with his strong accent, stiff drinks, and a true love for his customers, left big shoes to fill. One thing is for sure, The Moon Temple is consistent. 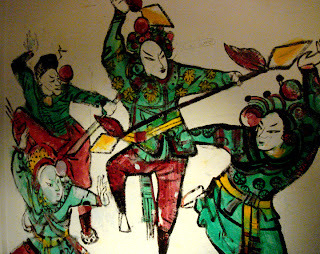 Johnny Chen, began bartending in 2000. With a flair for fun, a heart of gold, and an artist’s creativity, Johnny has gone the extra mile to meet his customers’ needs. Johnny is the creator of the original Trash Can, which has since been adopted by various surrounding establishments, has made it his mission to create a new drink annually, drawing crowds in to try these legendary concoctions." 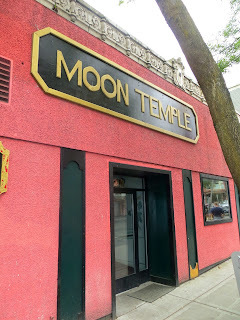 The Moon Temple Cafe was actually established earlier than 1958 in a location on the western corner of the same building. It is not clear if it had a bar at the time, as city guides list it only under restaurants, as it did for the early years at the subsequent location. But at minimum the cafe of that name was at the 2100 address by at least 1955.